Connect to your database server machine. Iron Speed Designer to retrieve the database schema to help you create user interface pages containing database information. No changes to the database are made during this retrieval process. Iron Speed Designer to create a set of stored procedures. Your application to display and edit data. 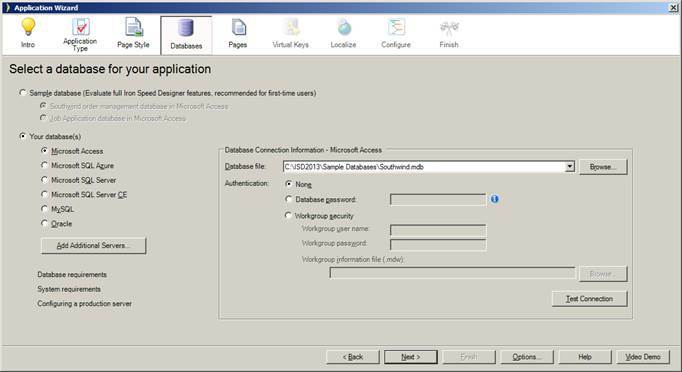 Iron Speed Designer uses ADO.NET specific drivers for each database such as Microsoft Access, Microsoft SQL Server and Oracle. By contrast, Iron Speed Designer does not use ODBC drivers to connect to databases. ODBC drivers do not support additional database-specific features, such as database-specific field types, which Iron Speed Designer supports. What is an Iron Speed Designer Application?